I used a few sets from GinaK Designs. I am in love with the card stock and ink from GinaK! The card stock is a dream to work with and the inks coordinate beautifully with it. I only have two ink colors so far, and I love the clear, crisp impression I get with them. I've also been browsing her Shop and there are soooo many stamp sets there that would be wonderful for water coloring techniques! My wish list is growing! Anyway...I have been wanting to watercolor a scene since I first learned this technique in class. I love trees and this one is just gorgeous. Both of the sets I used are illustrated by Theresa Momber and if you've never visited her blog, you must. I fell in love with the faux handpainting technique and just had to try it again. I stamped the tree first, using a light ink. Then, using Distress inks and markers a damp paint brush, I softened the edges and added color. Next, I did the leaves and the tire swing. I really like how this turned out. For the bird house, I stamped it onto a scrap piece of watercolor paper, painted it, fussy cut it out and adhered it to the focal. I wanted the leaves to be behind the bird house and for me, that was the best way to accomplish that. 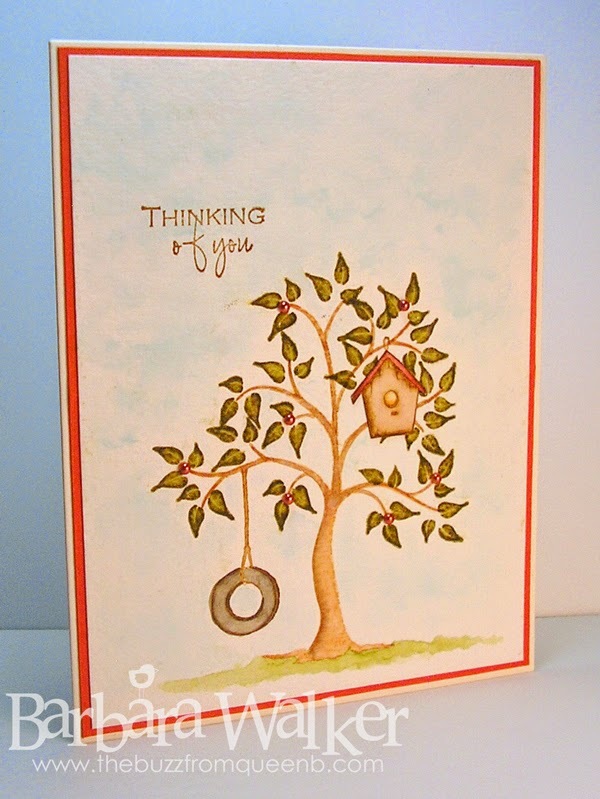 I stamped the little bird house hanger right onto the main image, though. It looks really cute in real life. 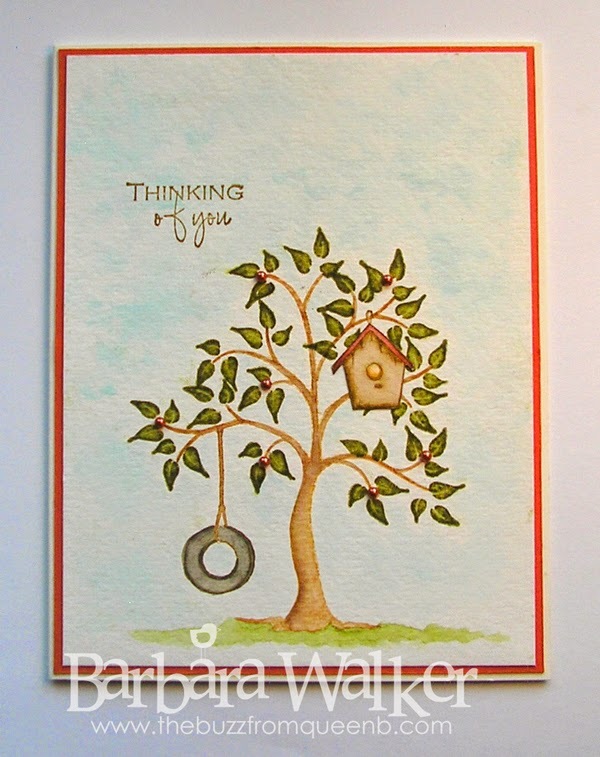 I added some blue ink for the sky, my sentiment and matted the focal onto GinaK Designs Tomato Soup card stock. I added a few copper pearls to finish it off. Super fun technique! As this class wraps up, I just have to say that this class was THE BEST one yet! I've taken a few Online Card Classes and they have all been great, but this one is was my favorite by far! And it's not too late to take it, because all of the class content will be available forever. How cool is that?! That's all I have for today. Thanks so much for stopping by. Oh my goodness, Barb, this is absolutely beautiful. It looks like a watercolor painting to me, not a stamp using a technique. THAT is talent. You are so good with watercolors, it's not a surprise to me that this was your favorite class. You seem to have taken to it like, well, a duck to water. *Ü* Thank you for sharing this card. I think it has to be one of my most favorite ones you've ever shared. Hugs! !